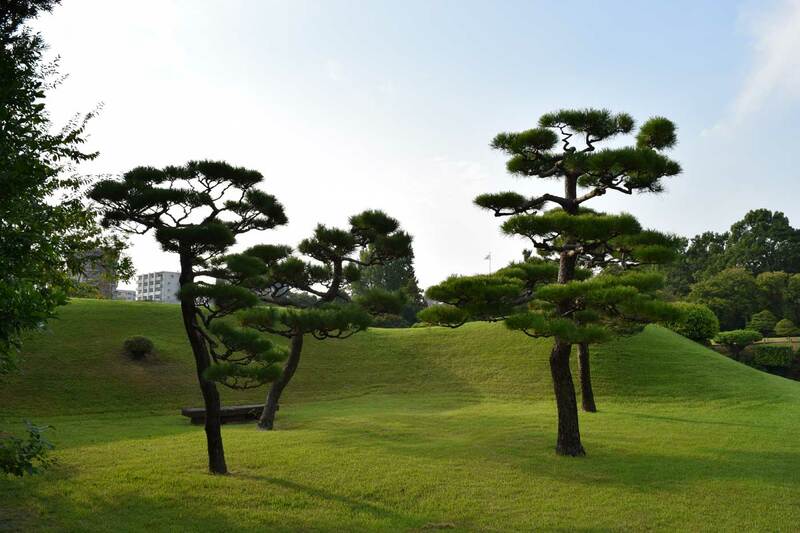 When I think of the constitutive role of pine trees in the soul of the Japanese people and their gardens, I think of an anecdote that happened to me in Japan. One sunny day in July I went for a visit to the Fukuoka Art Museum, a contemporary building in which orthogonal lines entertain themselves with captivating intrigue around the arena of the vast urban park, with the beautiful central lake adorned by isles and arched jumps of bridges. Upon entering the museum, I notice a nice tree about seven meters high, planted in the middle of an open court at the opposite side of the hall. I approach the tree and, as far as allowed by the glass walls that delimit the court, start my identification: the bark is gray and smooth, the leaves wide and oval, but there is no trace of flowers or fruits. As I am unable to recognize the species, I consult the lady at the reception desk with the hope of having some clues from her, who must have a daily frequentation with the plant. I point to the tree and pronounce my proverbial: “kore-wa nani, onegaishimasu?” (What’s that, please?). The answer arrives promptly: “matsu”. Only later I understood why the lady (who, despite not knowing the plant, didn’t want to leave me without a clue out of politeness) thought about matsu. The reason was to be found in the central position of the plant, his role as a prime actor in the scene. 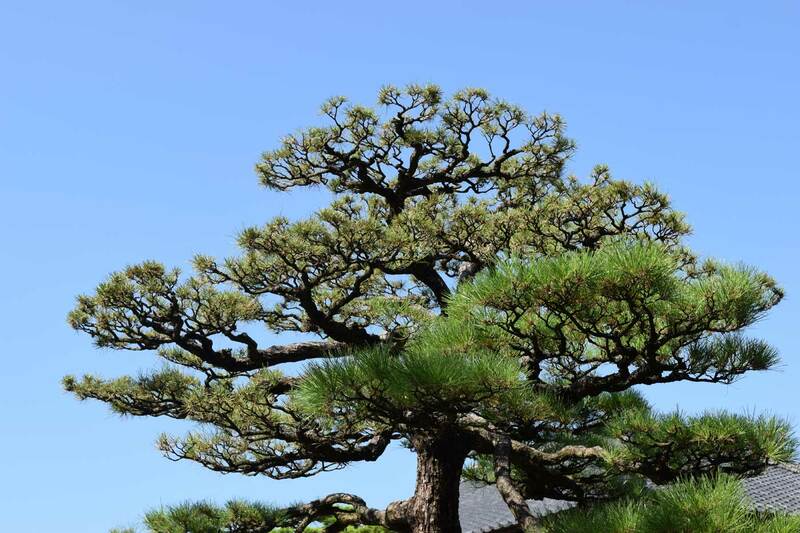 This role of dominance unconsciously evoked in the mind of the Japanese lady the idea of ​​pine. And here we come to the point of this story. Among the Japanese national passions is to classify all the possible classifiable subjects into the best three. 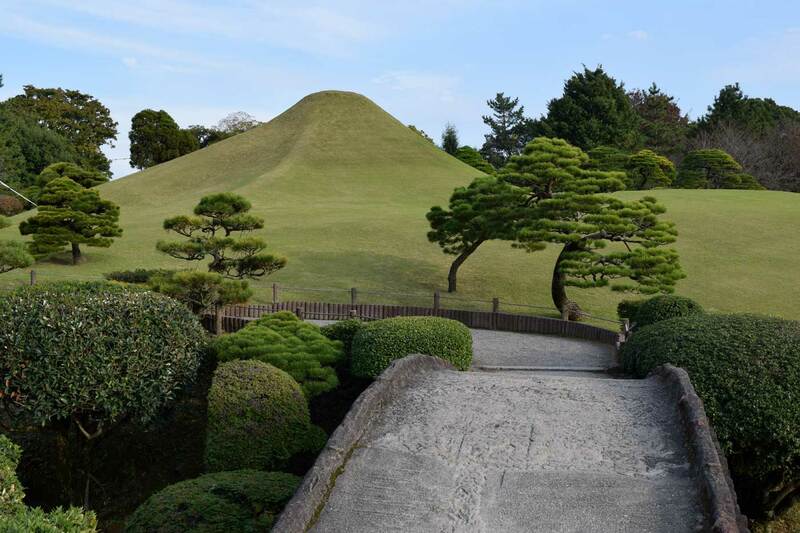 Such activity is promoted by the Ministry of Transport and Tourism as Japan’s Top Three, with the consequent promotion of official rankings for pretty much everything: gardens, castles, traditional scenery, modern scenery, night scenery, mythological animals and on and on. It is almost superfluous to say that there are also innumerable podiums for the vegetable kingdom. The most famous and revered grouping is known as sho-chiku-bai, a Chinese pronunciation of Japanese kanji that should be read matsu (pine, Pinus thunbergii), take (bamboo, Phyllostachys bambusoides) and ume (Japanese apricot, Prunus mume). The sho-chiku-bai triptych has long been a classic motif of decoration in the Far East, from kimono patterns to ink paintings, from ceramics to sake brands. First in the group is sho, the pine, prized for its timeless qualities: persistence of green, longevity, resistance and adaptability to the elements. The fact that in Japanese the matsu sound means not only “pine” (松) but also “waiting” (待 つ) is only the acoustic proof of the intrinsic affinity of the plant with those people, for which patient dedication and abnegation to adversities are values ultimate and incontrovertible. Over the centuries, the souls of the Japanese and the saps of the pines have joined in an almost symbiotic relationship. 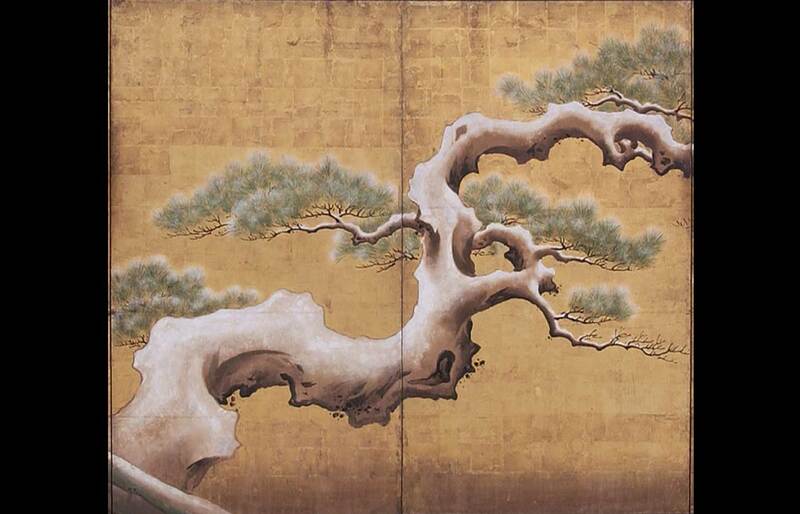 The Japanese artistic temperament is permeated by the sense of the pines. Pines are painted constantly in the backdrops of the noh theater; engraved on the wooden blocks ukiyo-e of Hokusai or Hiroshige; burned to get the ink from calligraphy; or posted at the entrances of the houses to receive the gods. And when the sun faded on the Empire, the mutualism reinforced and the resins mixed with blood. The pine’s turpentine provided air-fighters’ tanks, lacking fuel at the end of the Second World War. 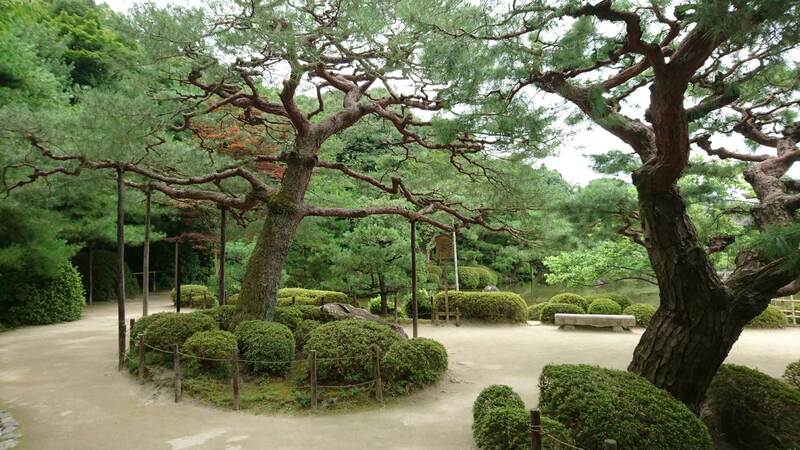 In Hiroshima, several pine trees and bonsai survived a few hundred meters from the epicenter of the atomic bombing. When the tsunami devastated eastern Japan in 2011, a lone pine stood on the coast of Rikuzentakata, the city razed to the ground by the water but lifted by the example of the tree. 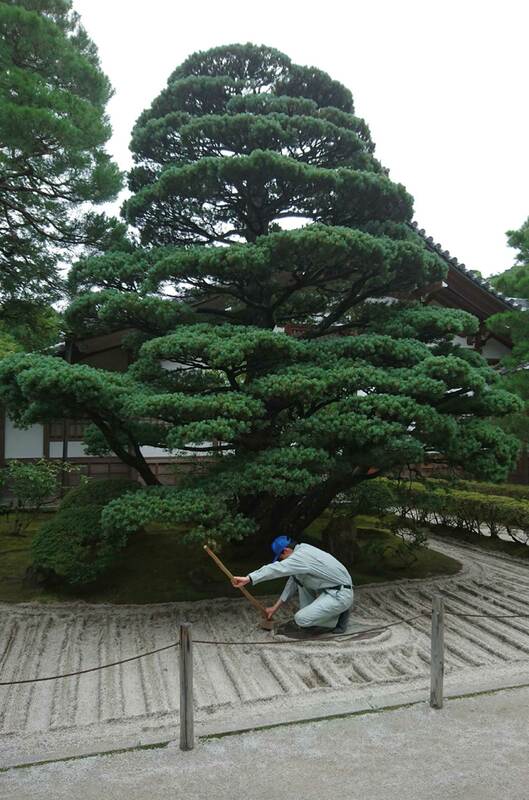 Pine trees are among the most indispensable and quintessential elements of Japanese horticulture. Together with the ubiquitous rocks and mosses, they shape the structure of those gardens, determining their genius loci. Since the Heian period (794-1185 AD), pines were selected as evergreen species of choice, a role that was that of cherry trees and flowering apricots among the deciduous trees. 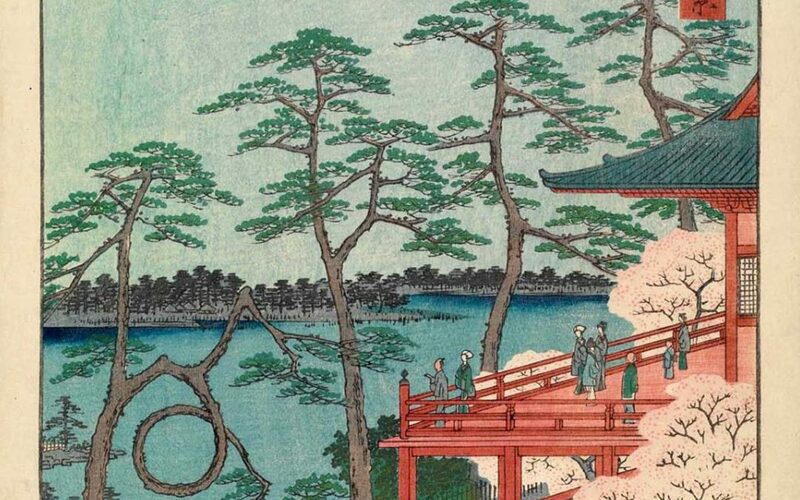 The ancient Sakuteiki treatise recommends planting pines around lakes and islets in the garden, thus evoking the idea of ​​a maritime landscape. 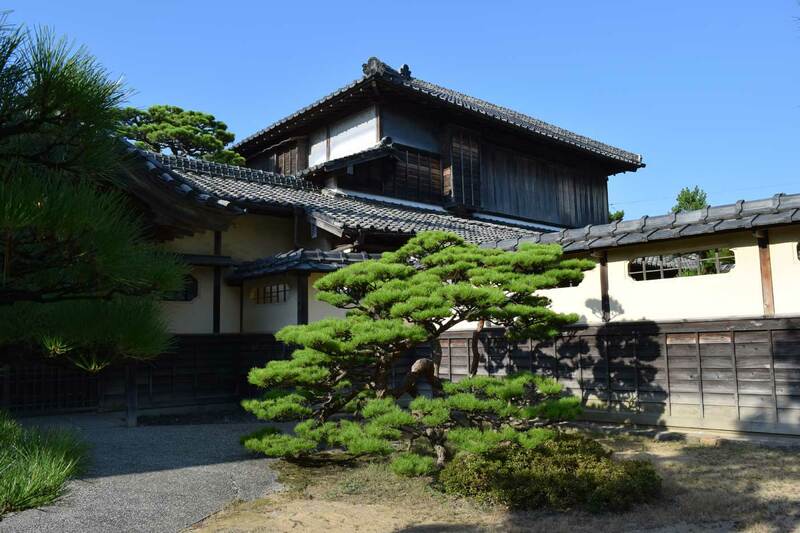 A pine was also always placed in the shinden, the court in front of the main house of the aristocratic properties. In the gardens of this period, still decorated with a lust and naturalism of Chinese derivation, the pines were sometimes adorned with wisteria flowers, revealing a taste not dissimilar to that of roses, honeysuckles and clematises cloaked on trees in Georgian England. 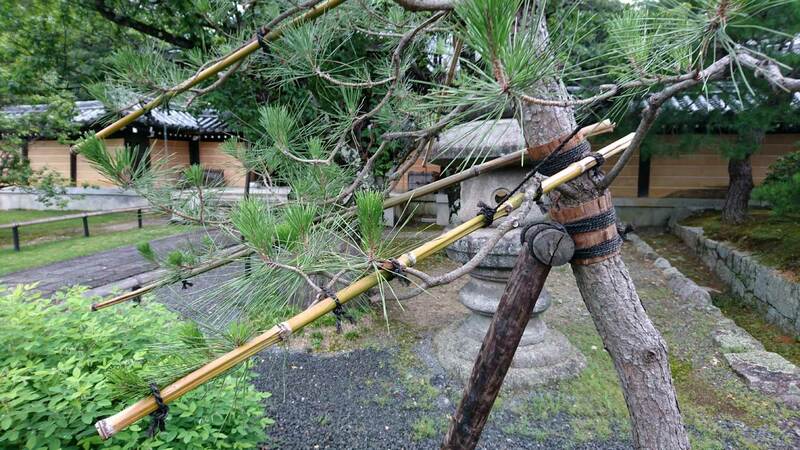 In the Muromachi and Momoyama periods (1336-1600), the Zen chastity will deny those indulgent garlands, yet without renouncing of the austere elegance of the pines, now unique vegetable actors in the dry gardens karesansui. During the Edo period (1603-1868), the nation was finally unified under the shogunate and pines were used to plant the new road axes that joined the Empire. The coasts especially were planted massively, in order to protect from tsunamis and erosions. 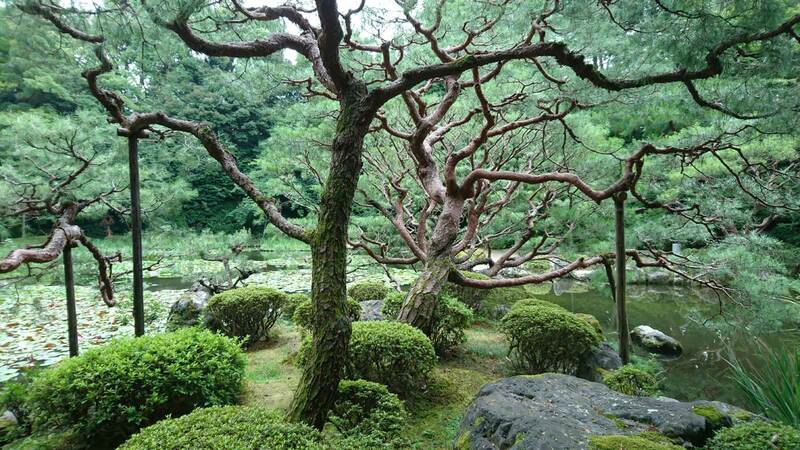 In contemporary Japan pines maintain a cardinal role. From the domestic gardens to the temples of the capital, one could excuse the absence of cherries or maples, but a pine specimen will never be missing. If the garden is small, the pine will be placed in a strategic position, often with the top of the canopy visible from the entrance gate. In traditional temples the trees will perhaps be planted in small groups, thus miniaturizing the idea of ​​mountainous or coastal landscapes. In the modern garden of Adachi Art Museum for example, pine trees compose space physically and metaphorically; in combination with rocks and azaleas’ topiary karikomi, groups of trees of different sizes define the perceptive scale of the composition, forming an extended backdrop of heights and depths that fades the boundary between garden and landscape. The emperor of the group is Pinus thunbergii, the famous Japanese black pine. It grows spontaneously in the coastal regions throughout the archipelago up to the southern shores of Hokkaido, from which point the climate becomes too rigid for its growth. The trees adapt well to poor and waterlogged soils, and have a talent for resisting drastic pruning, which makes them ideal prototypes for topiary and bonsaism. 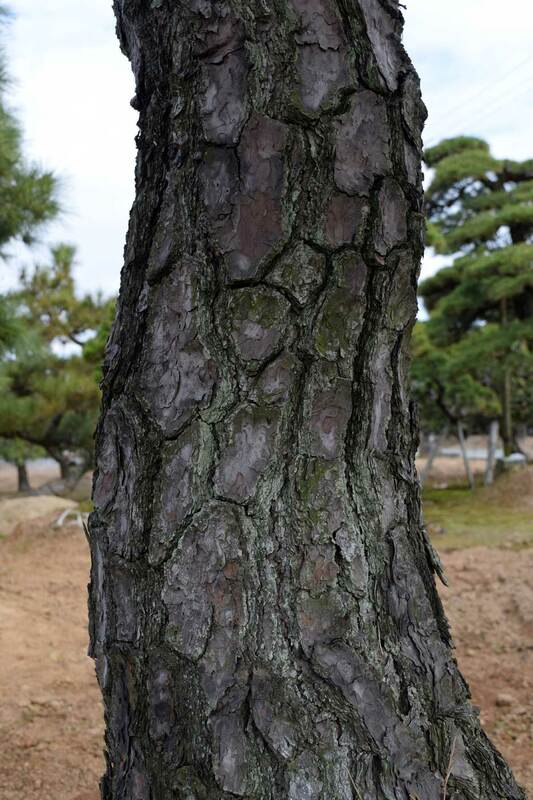 In Japanese Pinus thunbergii is commonly known as kuro-matsu (black pine), due to the dark tone of needles and bark. For Western taxonomists, however, the eponymous is Carl Peter Thunberg (1743-1828) and rightly so, since the Swedish naturalist and apostle of Linnaeus was the true botanical pioneer of Japan and author of the first scientific treatise of the archipelago, Flora Japonica (1784). 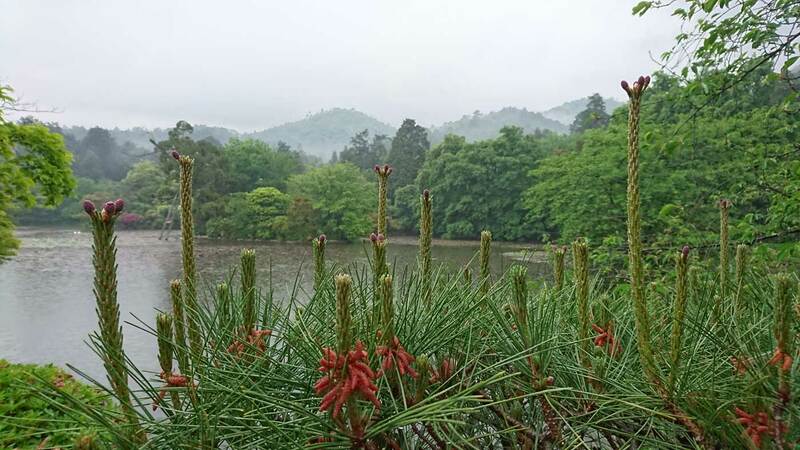 Pinus thunbergii is the most picturesque of Japanese pines, deploying in its parts a frank and hermetic drama that simply does not exist in the sister species. Like Thoreau’s hero, he is the simplest and most obscure of his peers. The skeleton of the branches certainly appears strong and tenacious, but a bit pendant, almost admiting the gravity of his life; dark and hardened needles are wrinkles frowned by time; and so the trunk, twisted and cracked like the tortoise’s shell, seems to be worn down by an inner tremor. On the second step of the podium is Pinus densiflora, the Japanese red pine or aka-matsu. This colonizes the pre-alpine strips in the central-southern islands, where its distributional extension is associated with an accentuated morphological variability. Among these natural declinations is the peculiar form umbraculifera, whose attractive umbrella crown has determined its fortune in ornamental horticulture. Pinus densiflora possesses a somewhat serene and luminous grace. The color of the slender trunks is the feature of ultimate value, with red-orange tones that enlighten the ornamental temperature of the trees, especially in the autumn twilight. In some gardens the barks are polished in order to enhance their brilliance, similarly to the birches of the English winter gardens. Morphologically Pinus densiflora is a close relative of P. sylvestris, to the point that hypotheses of synonymy were advanced by certain botanists. Within the Japanese archipelago, however, its closest cousin is P. thunbergii, which, like P. densiflora, has bundles of two needles; needles that are hard and thorny in P. thunbergii, shorter and more flexible in P. densiflora. The two species hybridize with each other, giving rise to P. x densi-thunbergii, an interesting cross that keeps the thorny needles of P. thunbergii, but has the smooth reddish trunk of P. densiflora. The dichotomy between the two species continues in folklore and horticultural tradition. While the natural temperament of P. thunbergii embodies the traits of masculinity, P. densiflora is associated with gracious feminine elegance; while the former is often employed in mass-plantations for parks and forestations, the latter rejoices in more intimate scenes, perhaps as a specimen tree in domestic gardens. But back to the podium of Japanese pines. 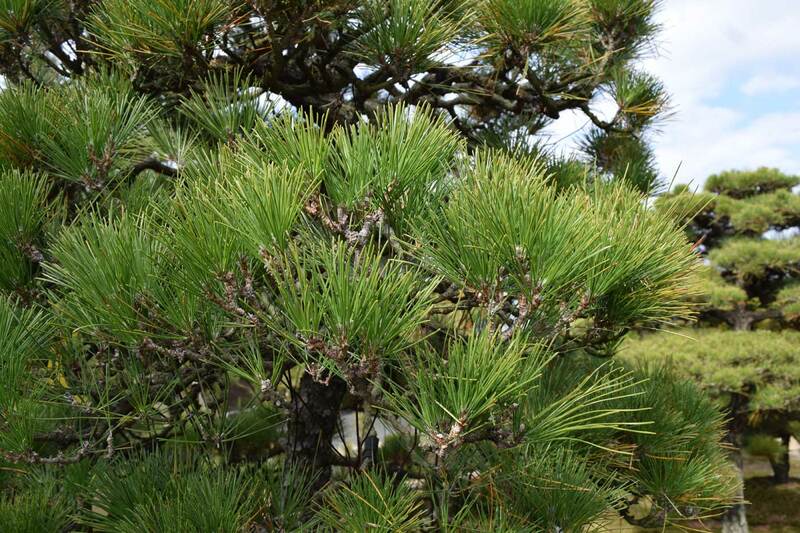 The bronze medal goes to Pinus parviflora, the Japanese white pine or “five-fingered” (goyō matsu) because of the bundles of five needles. This is a mountain type, with extensive distribution throughout central and southern Japan. A more northern variety exists, P. parviflora var. pentaphylla, characterized by the presence of reduced winged seeds. Compared to the black and red pines, the Japanese white pine presents rather different morphological features. Its needles are clearer, shorter and thicker, the growth slower and a little uncoordinated. Such peculiarities have determined its use for more specific and episodic horticultural situations. (But also electing this species a bonsai champion, where the reduced needles and the unbalanced forms represent a value, rather than a defect.) Above all, the white pine has an intriguing and very Asiatic glare, a celadon light that stands out in the twilight and at night. My memory goes to a wonderful goyō matsu placed next to the gravel garden at Ginkaku-ji, the silver pavilion, and to the dream of those branches and waves floating in the moonlight. In the golden pavilion at Kinkaku-ji, on the other hand, there is a wonderfully sculpted ship-shaped specimen, known as “Rikushu-no-matsu”. 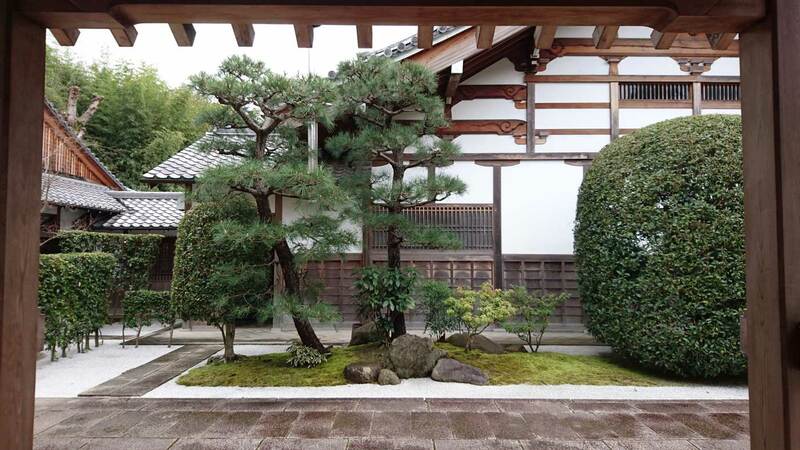 It is one of the three famous pines of Kyoto, wonderfully trained by a highly-manufactured bamboo latticework, showcasing the minute accuracy of the Japanese gardener. 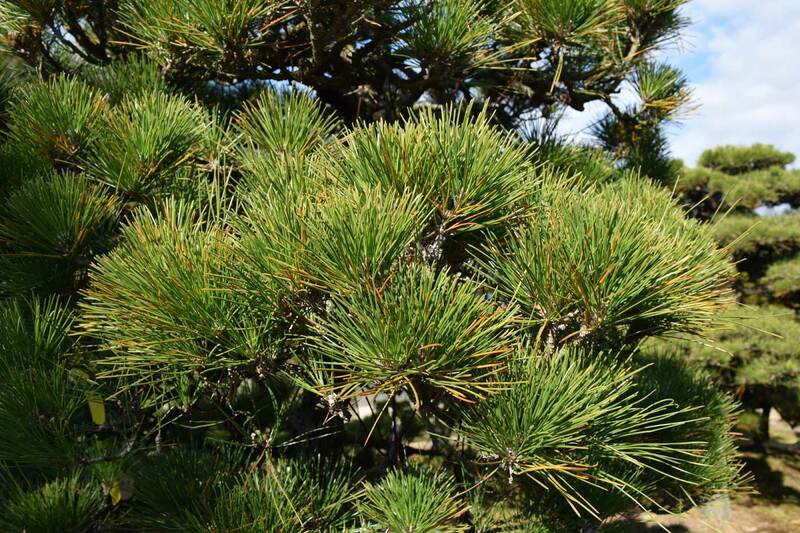 The reverence of the Japanese for their pines has led over the centuries to a degree of horticultural speculation that has no – I think – equal in other civilizations. Here the gardeners have not only selected and hybridized the pines to the ultimate limit that nature could have granted them. Those technical achievements were also obtained by the English with roses, or the Dutch with tulips. The Japanese gardeners went further. They imagined in the pine trees the subject of an aesthetic creation, the support itself of an autonomous artistic discipline. They lowered their souls deep in the secular calluses and rings of the plants, absorbing movements and balances, as if by masters; and finally translated those precepts into a style belonging to themselves, carving the limbs of the trees to the most abstract degrees of manipulation and artifice. Rarely in the history of mankind have nature and art merged into a higher temperature. Compared to the other trees, both evergreen and deciduous, the pruning of pines is a very distinct affair. Specific techniques are required, timing is crucial and results are slower to reach. 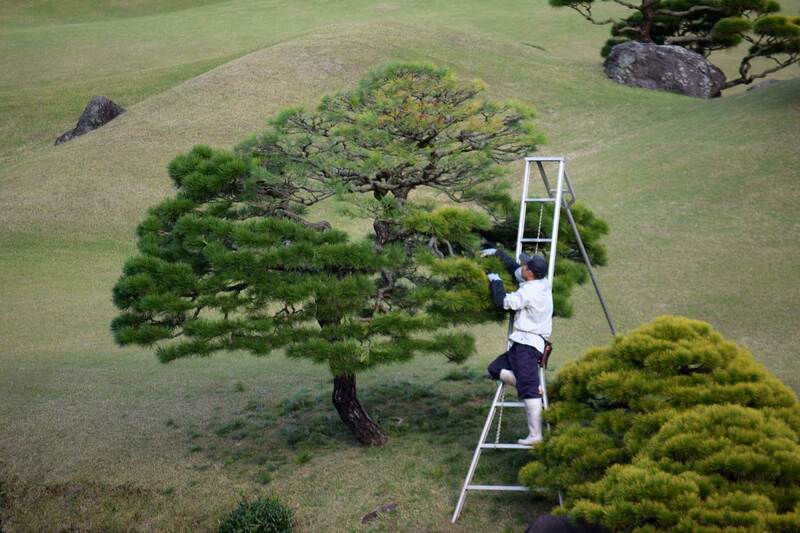 An old Japanese adage recites significantly: “a pine is a commitment that lasts a century”. Fascinated by the secrets of this art, one day in December I visited a pine nursery near the famous horticultural area of Kurume. Tadei-san greets me with a bow at the entrance of his nursery. We sit down in a rustic workroom, sunken in a corner of the vast garage of machinery. I get lost for a moment while observing the various tools and tinsels. Almost everything has an aura of translated indecipherability, as if it came from another universe or the world of the gnomes of Huygen and Poortvliet. Tadei-san’s wife brings us a teapot with two cups on a beautiful red-lacquered tray. In Japan, etiquette prescribes to always serve green tea to the guest. Tadei-san proudly tells me that his nursery has been active for four generations. Like his father before him, Tadei-san has learned the trade in the family. Once at the nursery, the pines go through a process of manipulation that with no exaggeration one could define as surgical. The trunks are curved and bent, the needles removed, the branches twisted, broken and bandaged with sticks, canes, wraps and ropes. 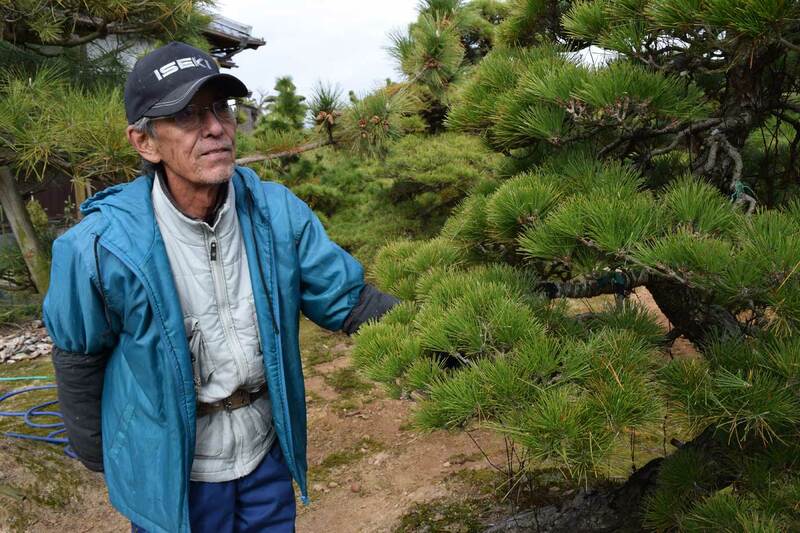 In such way the wild specimens become matsu-zukuri, “pines made by hand”. A collection of different models exists. 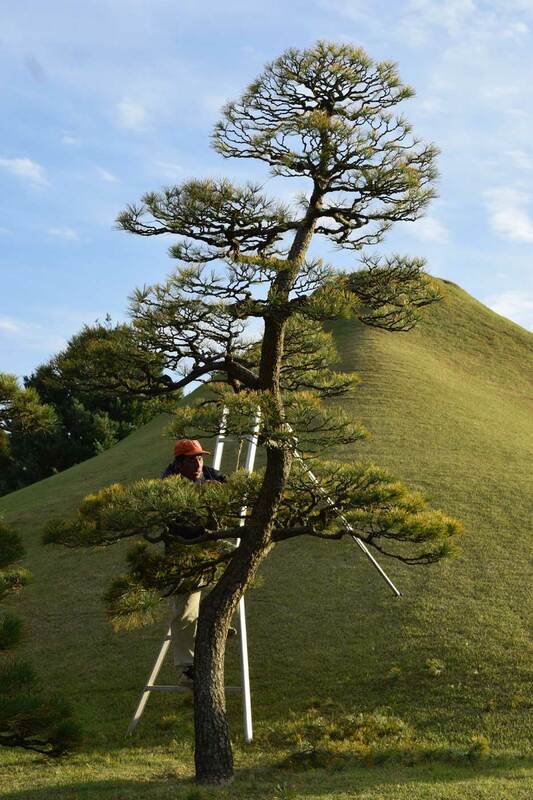 Tadei-san shows me a group of pines tama-zukuri, the style of stratified clouds so iconic to Japanese topiary. 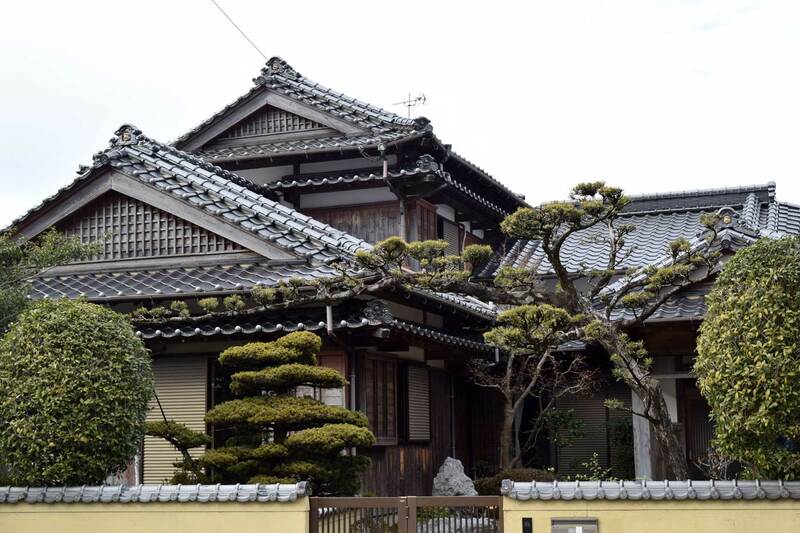 There is also a highly elaborate fused-zukuri pine, in which the branches are trained in horizontal tiers by means of bamboo canes and latticework. Planted here and there are gracious specimens of Podocarpus macrophyllus modeled in kai-zukuri and dan-zukuri styles, respectively “steps” and “shells”. It is a Spartan education. The root system is often limited in pots or hessian bags, and the photosynthesis periodically minimized by the drastic foliage removal. Many trees come out with broken bones, they will never shape well-balanced matsu-zukuri; but others prove to possess seikaku, “good personality” according to Tadei-san, embracing over the years an honorable and long-lived destiny. I can see in the ranks of this nursery the same regimented spirit that permeates all the environments of Japanese society, from school to army. The individual must bend to the rules imposed by the society; and if the social structure is inflexible, the individual is called to be flexible. Flectar not frangear. It is a Spartan education, but the results possess an lightness and joy that seems almost hedonistic. The rusty stacks of canes and laces on the ground have little to do with the beautiful reachings of the opened canopy. The bulk of green has dissolved in an ethereal landscape of clouds that seems to come out of a dream, or the possibilities of a parallel life. 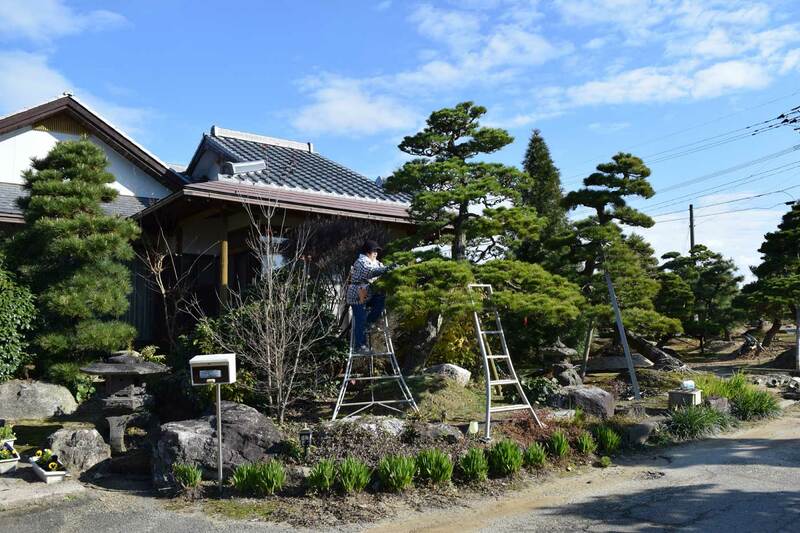 Tadei-san explains to me that once the desired size and shape are achieved by means of pruning the branches, the work on the candles becomes the principle way of controlling and maintaining the pines. The candles are the young apical shoots, initially covered by the still-closed needles. The uniqueness of pine pruning lays in the specific techniques on such organs. The definition of pruning becomes improper itself, as the manipulation of pines occurs on supports and with tools absolutely diagnostic of the genus that are not found in other woody species, either gymnosperms or angiosperms. It would be like comparing the techniques of ink-brush calligraphy scrolls with those used in large oil on canvas paintings. In Japan, pine candles are clipped twice a year. At the beginning of summer the midoritsumi (or metsumi for the bonsaists) takes place, where the young candles are snapped by hand. Timing is crucial and varies according to the species. It is necessary to intervene before the needles open up and the resin starts forming, but also not too late in the season, so as to allow time for the re-growth of the shoots during the warm months. Tadei-san operates midoritsumi between June and July. In autumn until early winter it is the turn of the second process, known as momiage (curiously translatable with “sideburns”), in which the now lignified candles are selected in number, and the previous-year needles shaved away. Thus, the terminal ramifications assume a slender and vibrating appearance, almost resembling the octopus’ tentacles, which is particularly attractive when observed from below. Tadei-san invites me to try a little momiage under his guidance. I clip off by hand the central candles, and keep the lateral pairs. Then I peel away the old needles at the base of the branches. The ramifications immediately gain balance and readability. I realize that although the technical concept is relatively simple, the success of the operation depends on the degree of experience and vision of the gardener. It is necessary to know how to read the plant, continuously alternating scales and relations of the observation. Thus, although each pine is manipulated by the gardener, at last it still narrates – yet distant, almost imperceptible –() its character and primordial nature. In Tadei-san’s nursery there are no equal pines. He tells me that every plant possesses a keshiki, a scenario. This is the intrigue of forms, colors, vibrations internal and external to him. The task of the gardener is to know how to read and describe this story, in the quiet and sacred dialogue of branches and secateurs. What happens here then? Is it the art that naturalizes or the nature that artilizes? In the middle of the wooden table in Tadei-san’s studio, are those cherry-blossom branches alive, or rather glossy castings of plastic? And these chopsticks with which I’m eating now, are they made of bamboo or just balsawood worked from South America? And again, looking up at the votive altar at the back of the room, could the worn green propylene mat not be a moss landscape prostrate at the foot of a temple? And those gravel pebbles aside that seem to exist for no reason, perhaps the benign backdrop of the mountains dear to Tadei-san’s family? I do not know if there really exists a line of demarcation in such fluctuating paradox, where everything appears to be a foreign and elusive feel to my Western grasp. 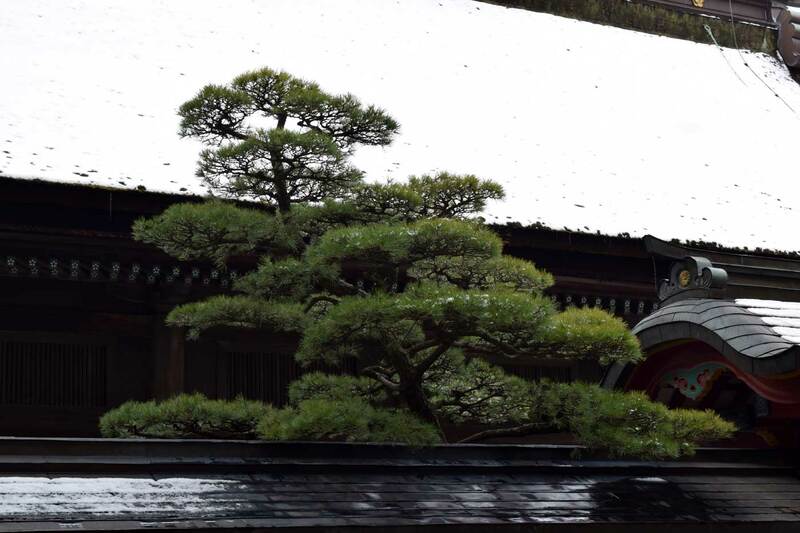 But I think that in the dance of this blurred sfumato lays the ultimate moral of Japan and of the sensuality – rustic yet ethereal – of those gardens and the clouds pruned of pines.